Surprise! – now he is allegedly in trouble once more. The Hacienda Heights area ex-cop-turned-bail-bondsman has plead not guilty to charges that he illegally solicited bail from inmates in local jails. County District Attorney’s officials have accused Lee of no less than six felony counts. 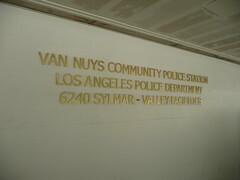 The incidents that led to his arrest supposedly took place at the Van Nuys jail on or about July 27, 2008 and Feb. 10, 2009. Ironically, Lee does not have to be bailed out of jail himself (good thing, because if he called around and bondsmen knew the charge, he might have a hard time getting out). He has been released on his own recognizance and is due in Los Angeles Superior Court on Feb. 23 for a preliminary hearing, DA’s spokeswoman Shiara D vila-Morales confirmed. “In essence, the defendant is accused of going to the Van Nuys jail and soliciting Korean-speaking arrestees to post their bail,” D vila-Morales elaborated. Edwin Lee has a current bail bond license, speaks fluent Korean and operates his business out of Koreatown, according to the article. It seems to me that the Department of Insurance ought to have that suspended by now. The charges against the former LAPD police officer include two counts each of approaching prisoners to solicit bail, approaching prisoners to solicit bail inside a jail facility and failing to keep records of these solicitations. Bail bond agents are legally forbidden to approach people to solicit bail. They can only do so if they have been contacted by the arrestee, a family member, friend or other interested party, first. It is also a separate felony to solicit bail in a jail facility, but since no records were kept of the alleged solicitations, Edwin Lee was not charged for this. Simply put, in the bail industry, a client must contact a bail agent. It is illegal for a bondsman to call and offer unrequested services. Calling a family member is perfectly legal if the defendant contacts the bail bondsman first and asks the bondsman to do so. I’m pretty sure agents out here are “soliciting” bail at the jail while “faking” that a family member contacted them 1st. It’s pretty immoral and illegal to be doing that. I’m sure you’re right, Matt. The scams are endless. It hurts the consumer and the bail industry. Now only if we can get these idiots from soliciting in front of jails and courts, offering 6% bail ..the bail industry is going to hell. Isn’t he the same “Lee” now the Victim of a Hit & Run Homicide……?????? I don’t know the details, but I do know he died in some sort of car accident. Sad situation all around. This guy is the perfect example of why the bail industry is going to hell. Now if the clowns who hang out in front of the jails (we all know who they are) would act legally, we can all thrive. But they will be out soon enough. You have a good point, Travis. Unfortunately for this guy, he died in an auto accident before he could appear on these charges.